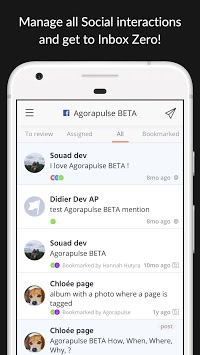 Agorapulse is a social media management tool for Facebook, Twitter, Instagram, LinkedIn, YouTube and Google+. The mobile app is an easy, on-the-go companion to your desktop Agorapulse account. 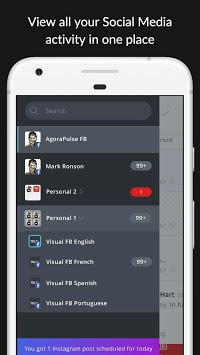 You’ll have the best of Agorapulse’s social inbox, monitoring, and publishing features in the palm of your hand. -Tap on the calendar to see what’s scheduled, queued or published for that day. 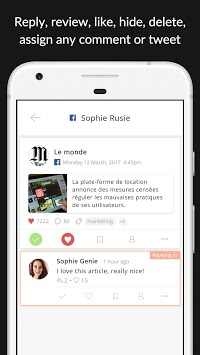 -New users learn about the app’s engagement, listening, publishing and reporting features. -Design change to the publishing “assign to” screen. -Fixed: Retweet capability from swipe left menu. -Fixed: Unintended cap letters in saved replies. -Fixed: Alignment issue in notification center. -Fixed: Assign modal when publishing.